Over the past few years I’ve become more and more fussy about what products I put on my skin. I refuse to spend on high end products if I know they’re filled with chemicals. I try to be a little more conscious when it comes to buying cruelty free products and opt for products with ingredients that will actually help my skin out. I recently applied to work with Facetheory and I was thrilled that they picked me as one of their chosen bloggers to send their products out to. I had first heard of the brand on twitter. Their social media presence is brilliant so I did a quick search and was pleased to find that they are completely cruelty free and not only that they’re paraben free too. Not to mention the microbeads in the exfoliator are not made from plastic which will harm the environment. Facetheory’s website is super simple to use and brilliant if you’re new to skincare. Their slogan is “Skincare that’s personal” and that sums the brand up perfectly. The website allows you to put into it your skincare needs and it will work out the best products for you. For my combination skin, the exfoliating cleanser was recommended for me and to be honest, just by looking at the bottle I could tell it was going to be a good one! The packaging is a slim white bottle made from sturdy plastic. There is a hand pump which is great for cleansers and it’s easy to carry around when I’m travelling. The product itself is a rich and creamy cleanser that is easy to spread across my face and lathers well. 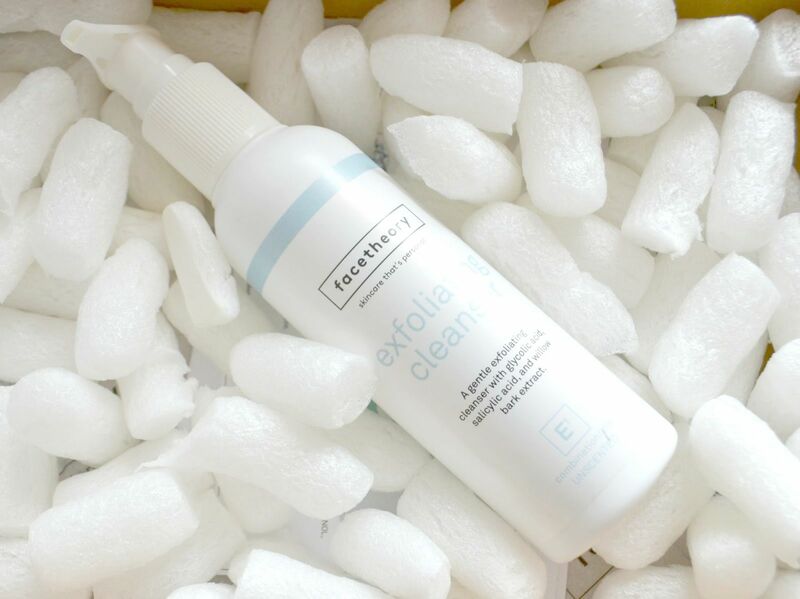 Another option that Facetheory give you is to order the exfoliator as scented (with essential oils) or unscented. Awesome right? I mean, why aren’t more brands doing this?! I’m really funny about smells so I went for the unscented option and was really glad I did. The small grains that help with exfoliating are teeny weeny grains of pumice stone. I was initially a little worried about scraping my face with this but I later found that they don’t hurt or scratch my face at all. The exfoliator is made for daily use which is brilliant for me because I have a lot of dry skin days where I really need to just remove all the dead skin off. I’ve been using this product for nearly 3 weeks every day and it’s made a huge improvement to my complexion. My face looks brighter and my red marks from acne have faded substantially. I’ve been off roaccutane for a a good few months now and I always worry my acne will come back with a vengeance, but tbh with all the amazing ingredients that are in this exfoliator, it will be quite easy to help prevent future breakouts. If you have sensitive combination skin, I couldn’t recommend this product more! Have you tried Facetheory products yet?